Premium grade 7 layer co-extruded cast film delivers 250% stretch and a strong and consistent yield giving you outstanding coverage and value for money. Crystal clear gloss finish provides easy identification and excellent scanning clarity. 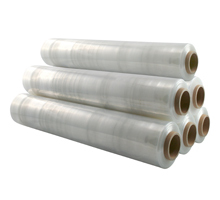 High puncture and tear resistant film provides greater load retention and robust performance for even the most difficult loads. Epic Stretch's quieter operation is perfect for low noise environments. Outstanding coverage protects your valuable merchandise from water, dust and moisture during both transit and storage.